11 How long does Viral exanthema last? 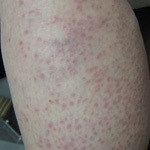 It refers to a non-specific rash that is characterized by a generalized eruption of erythematous papules and macules. It is related with systemic infection and is often accompanied by lymphadenopathy and fever. It is caused by viral infection of the skin. The name “Viral exanthem” comes from the merger of two words “Viral” standing for “caused by or related to virus” and “Exanthem” which is another name for a skin eruption or rash. This is a highly common condition. However, its exact incidence is not known. 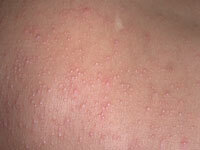 The lesions erupting on skin surface may arise due to a host response or as a result of replication in infected cells. In case of an infection, the virus enters and incubates (hatches) inside the body. This is followed by a viremic stage that leads to fever and dispersion of viral particles to all body tissues. 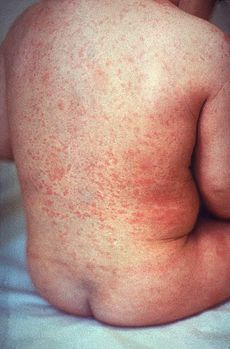 This is often followed by a perivascular inflammatory reaction to the virus, which causes development of skin eruptions. The condition is also supposed to occur as a side effect of medications, such as antibiotics. This disease is extremely common in children. Kids who have not been vaccinated against chicken pox, rubella and measles are at greater risk of having this condition. Children with this disorder typically contract the syndrome from other affected kids in their schools or other public places that they visit. They usually remain ill only for a short time. The virus enters the lungs of others when they inhale the droplets. The virus may also spread during contact with infected saliva or nasal mucus. If Cervical lymphadenopathy is suspected, physicians can check for redness of eyes and inflammation in the neck glands. In many cases, treatment is not necessary for the resolution of this disorder. The condition usually goes away naturally. In some cases, particularly where infections by organisms like bacteria are the cause, administration of medications (like antibiotics) can be useful. Anti-viral therapy may also be helpful in resolving some cases. For acute forms of this disease, treatment is generally symptomatic. This is a non-dangerous condition and generally resolves without treatment. With proper treatment, persisting cases of this disease do not last long and rarely lead to any severe complications. How long does Viral exanthema last? Without treatment, the syndrome usually takes a little over 10 days to go away. Proper treatment can make more severe cases resolve within a week or two. Those found to be at particular risk from this disease generally include individuals who suffer from upper respiratory infections or diabetes. People living or working in a nursing home or participating in activities in day care centers are also susceptible to this condition. This disorder is also found to affect people suffering from a weakened immune system due to an organ transplant, an ongoing Chemotherapy or presence of underlying conditions like AIDS and HIV infection. Check out these Viral exanthema images to know how this syndrome affects the skin. These Viral exanthema photos will give you a fair idea about the physical appearance of VE sufferers. If you find signs of persisting Viral exanthem in adults or children in your family, immediately call your healthcare provider. Timely diagnosis and treatment will go a long way to ensure fast and effective recovery from this discomforting disease.